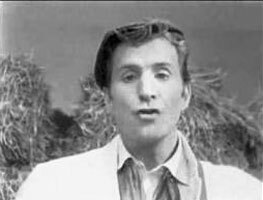 Chanteur Country US né le 3 Décembre 1927, originaire de Flat River (Mississippi), Ferlin Husky a fait ses débuts à Baskerfield (Californie) en tant que Disc-Jockey à la fin des années quarante, utilisant le nom de Terry Preston. Un duo avec Jean Shepard en 1953 chez Capitol Records lui permet alors de poursuivre une carrière solo entamée pour 4 Star Records. 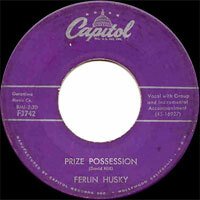 Il a enregistré sous le nom de Terry Preston, Ferlin Huskey puis sous celui de Simon Crum chez Capitol Records. 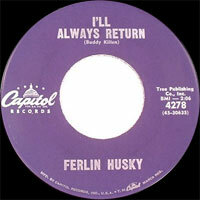 Puis il s'impose en tant que Ferlin Husky, toujours chez Capitol. Il est décédé le 17 Mars 2011 à Nashville (Tennessee). 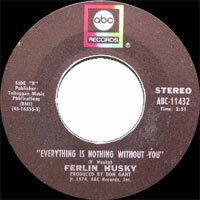 Ferlin Husky had three separate careers. Out of the three, the best known is his country-pop career, which brought him to the top of the charts in the late '50s, but he was also known as a honky tonk singer called Terry Preston and a country comic named Simon Crum. Of course, Preston and Crum are just footnotes to Husky's very popular career, even though Crum nearly became a household name as well. During the late '50s and early '60s, he had a string of Top 40 country hits, highlighted by two number one hits -- "Gone" and "Wings of a Dove" -- which each spent ten weeks at the top of the charts. 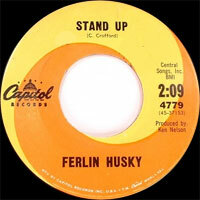 Husky wasn't able to sustain that momentum, but both of the songs became country classics. Born and raised on a Missouri farm, Husky became infatuated with music and began to play guitar as a child. During World War II, he enlisted in the Merchant Marines, where he occasionally entertained the troops on board his ship. Following the war, he became a DJ in Missouri, then in Bakersfield, California. 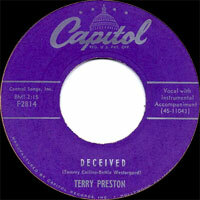 While he was in California, Husky began using the name Terry Preston, because he believed his given name sounded too rural. He also began singing in honky tonks, using the Preston name. At one of his gigs, Tennessee Ernie Ford's manager Cliffie Stone heard Husky and took him under his wing. 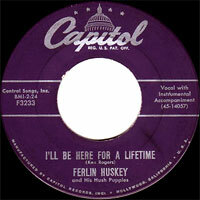 Stone helped Husky secure a record contract at Capitol Records in 1953. 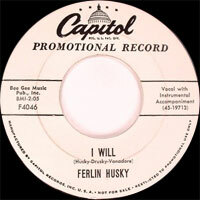 As soon as he signed with Capitol, he reverted to using Ferlin Husky as his performing name. 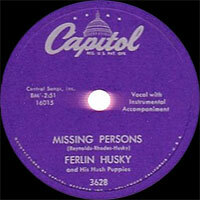 Husky's first records were generally ignored. It wasn't until he sang on Jean Shepard's "A Dear John Letter" that he had a hit. "A Dear John Letter" became a number one hit, but Husky wasn't able to follow it immediately with a solo hit, although the duo had a sequel, "Forgive Me John," later that year. Husky didn't have a solo hit until 1955, when "I Feel Better All Over (More Than Anywhere's Else)" and its flip side, "Little Tom," climbed into the country Top Ten. Around the same time, he developed his comic alter ego, Simon Crum. Husky signed Crum to a separate record contract with Capitol and began releasing records under that name. Husky racked up a consistent string of hits during the late '50s, reaching his peak in 1957, when "Gone" spent ten weeks at number one; the song crossed over into the pop charts, climbing to number four. That same year, he began an acting career, starting with a spot on the Kraft Television Theatre program and the film Mr. Rock & Roll. 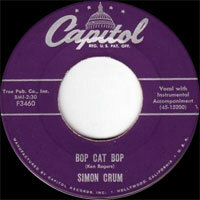 In 1958, Crum had a number two hit with "Country Music Is Here to Stay." Though he had several hits in 1959, none of his songs broke the Top Ten. In 1960 he had his biggest hit, the gospel song "Wings of a Dove," which was number one for a total of ten weeks and reached number 12 on the pop charts. Despite the massive success of "Wings of a Dove," Husky wasn't able to sustain a presence on the country charts during the '60s. He remained a popular concert attraction, but he had no Top Ten hits between "Wings of a Dove" and "Once," which hit number four in 1966. A year after "Once," he had his final Top Ten hit with "Just for You." In the late '60s, Husky managed to incorporate the slicker, heavily produced sounds of contemporary country-pop into his music, which resulted in his brief career revitalization. Husky kept racking up minor hits until 1975. In 1977, he had heart surgery and briefly retired from performing. During the '80s and '90s, he performed regularly at the Grand Ole Opry, as well as Christy Lane's Theater in Branson, Missouri. During the 2000s Husky suffered from severe cardiac problems, and was hospitalized for congestive heart failure and pneumonia in 2009. 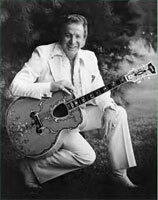 He died of cardiac arrest at a hospital in the Nashville area on March 17, 2011; Ferlin Husky was 85 years old.